We’re gearing up for the 4th of July! It’s especially fun this year because — get this — Kiddo has all kinds of foods that he likes now! He keeps trying something new and saying, “I CAN’T BELIEVE I’VE BEEN MISSING OUT ON THIS!” Top of that list? Peanut butter. He would now eat it all day every day if I let him, so he was excited to be my official taste tester for these little treats which I adapted from Momadvice.com. Verdict: thumbs up! 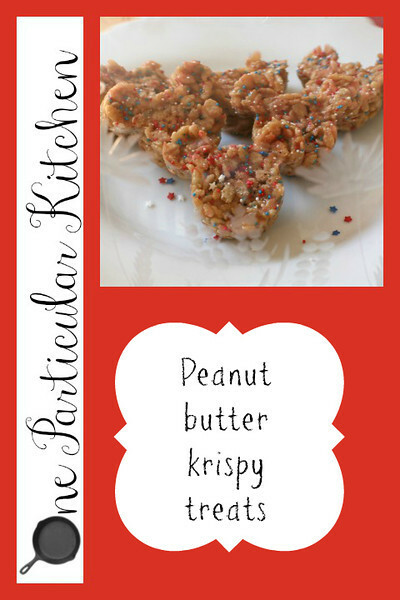 I think you could pretty much make this with whatever cereal floats your boat, but the peanut butter sauce is so sweet that I wouldn’t pick a very sugary cereal — might be sugar overkill. I’m really hoping my 3 year old starts acting like kiddo. I really need her to start liking more foods other than mac-n-cheese, grilled cheese, and pop tarts. Sometimes I feel like screaming!!! I bet the cinnamon in this is awesome. Good write-up, I am normal visitor of onesite, maintain up the nice operate, and It is going to be a regular visitor for a long time.